In development (but nearly complete) HTML5 rogue-like. Intended to be playable in roughly one hour with a great deal of variety between playthroughs. Can't load the game here anymore, and it's an older version hehe! This is endless fun, thank you! Thanks for this! I haven't found game documentation, like shortcut keys, etc. Is there such a thing? For example, wondering if there's a way to attack red mushrooms with a non-ranged weapon. There doesn't seem to be a ice/cold magic skill in place to level up so you can't use the ice/cold book. That book also has one req labeled "ice magic" and one as "cold magic". Thanks for the feedback! That's a great idea, I'll work it into the next update. Cool game, I hope you'll continue working on it! Thank you. I'll be working on updates over the next few weeks. I've got another project I want to work on, but I'll eventually return to this and work on a Rogue Fable III. Yay! I'm a big fan of Rogue Fable, but it got a bit easy after a while and I had to give myself challenges to make it tricky again. I already have all kinds of thoughts, but I'll give this one a dozen playthroughs or so so I can give more nuanced feedback. The only thing I'll say right away is... I found Rogue Fable II completely by accident --- I went to play Rogue Fable I and accidentally clicked on 'images' and saw the title screen. 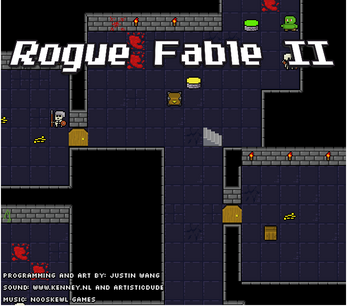 So I suggest advertising Rogue Fable II directly on anywhere you've hosted Rogue Fable I. Thanks! Hey Thelbin, I've sent you an email to contact me by, let me know if it didn't go through.